So after discovering barbecue sauce I was on a mission to make stuff to put it on. This culminated in a meal a lot better than I imagined. I don’t mean to brag or anything, but I may just be a culinary genius. I may also not be… but… maybe? Softly toss the tofu in the corn starch so it gets a light coating. Rub the eggplant in the oil, and leave to sit for a minute (or while you cut the rest of the veges, time isn’t so important). On the barbecue (or in a frying pan), fry up the tofu, eggplant, onion and mushroom – but try keep the tofu separate until it’s cooked. Once everything’s cooked mix it all together and add in half the barbecue sauce. Cook for another minute or so, then serve pouring the rest of the barbecue sauce over the top to make it look delicious. Now, I have never been one to say YOLO, except for when making fun of people who do say it, but seriously guys, you do only live once so you should eat as much of this as you can! It takes all of 4 minutes to make (and 3 of those are microwave minutes, which barely even count), and you probably have all the ingredients in your cupboard already. Shamelessly stolen from the internet, this sauce is great on anything – from pizza to tofu (well… those are the only two things I’ve tried it on so far), and can also be used as a marinade. 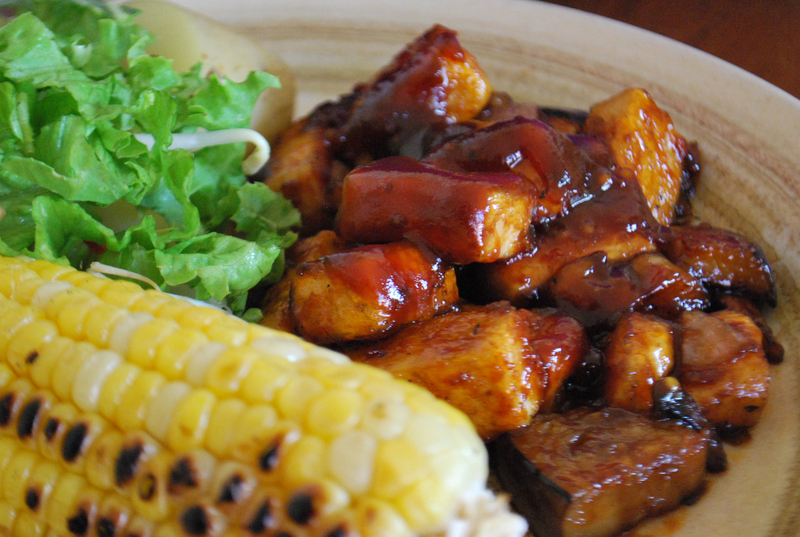 I made barbecue tofu that you can find by clicking this sentence. Add all the ingredients except the corn starch into a jug or bowl. Microwave for a minute, mix, then microwave for another minute. If you want a runny sauce to pour over your food then you’re done. If you want a thicker sauce for a marinade then mix in the corn starch and microwave for a third minute. Done! I wanted Cake. I think Jess wanted cake too. So I made up a recipe, straight out of the blue, with only a vague idea of where it would be headed. Turns out I’m a GENIUS – the cake was AMAZING. Soften the margarine, then beat in the sugar and finally the vanilla essence. Sift in the flour and baking powder. Add the golden syrup, raspberries and water and mix to form the cake batter. Taste some (for science). 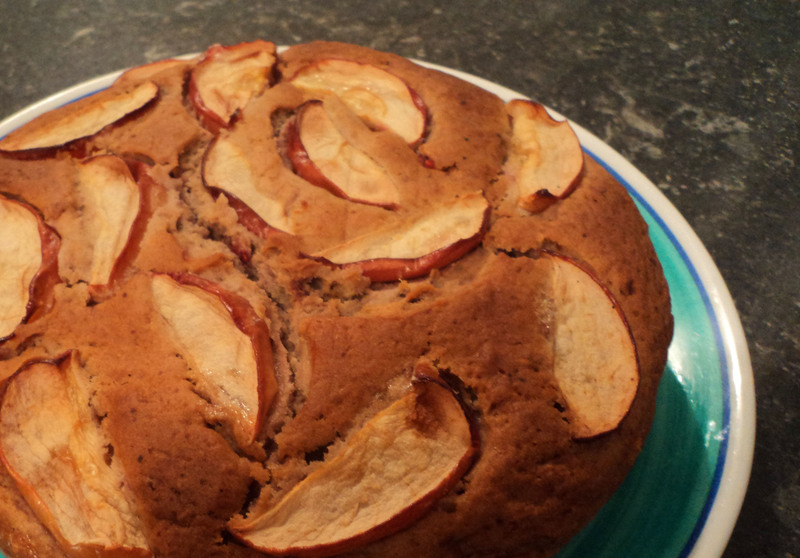 Line a cake tin with some baking paper, and then layer the base with one of the sliced apples. Pour the batter over the apples (have another taste). 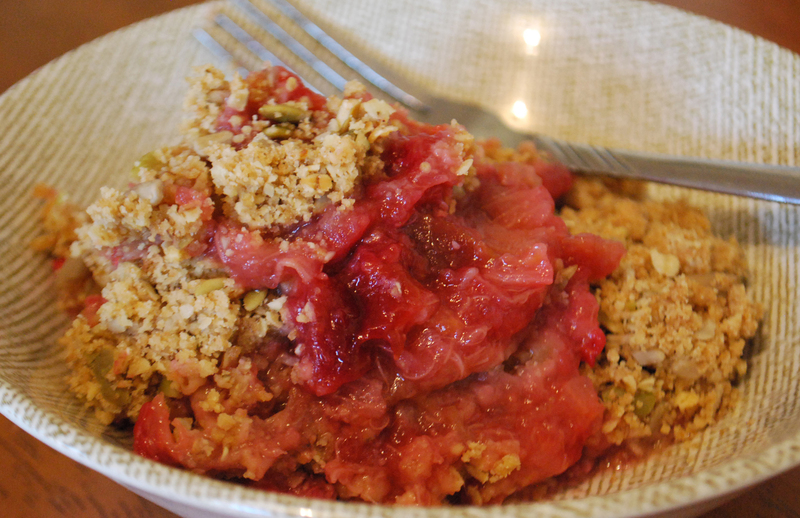 Use the second apple to add a top layer of apples on the batter. Bake at 180°C for 1 hour, or until an inserted knife comes out clean. You probably want to add some caramel sauce to this (we still haven’t told you how to make it, have we? ), or some other sugary drizzly thing. 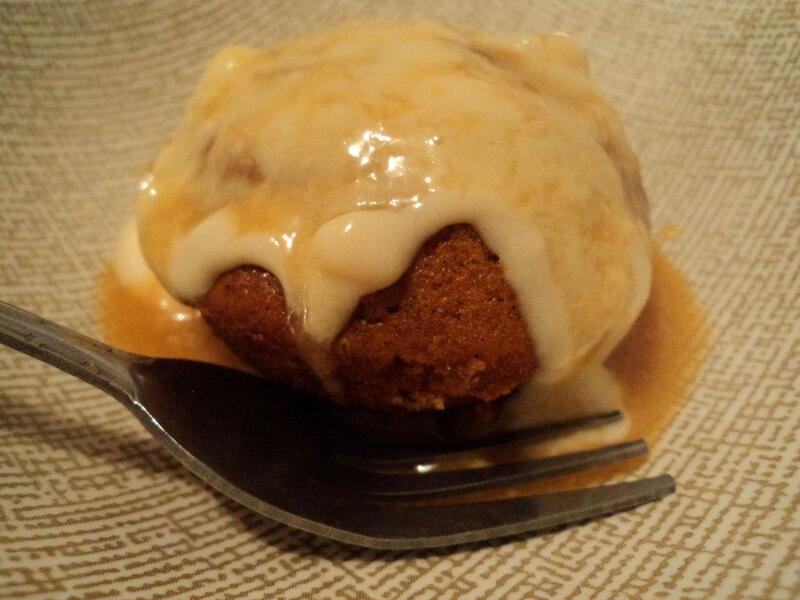 Having absolutely no idea how to make sticky date pudding, I kindly corrected her, and set out to prove her wrong. It turns out, our firm dates are fine! I guess the moral of this story, is that those lacking in faith should not proceed. You must have a strong will, a determination to succeed, in the face of imperfect ingredients. If you have what it takes, scroll down. But be warned, even after successfully baking this slice of heaven, your will shall be tested – You must not consume them all in one go! 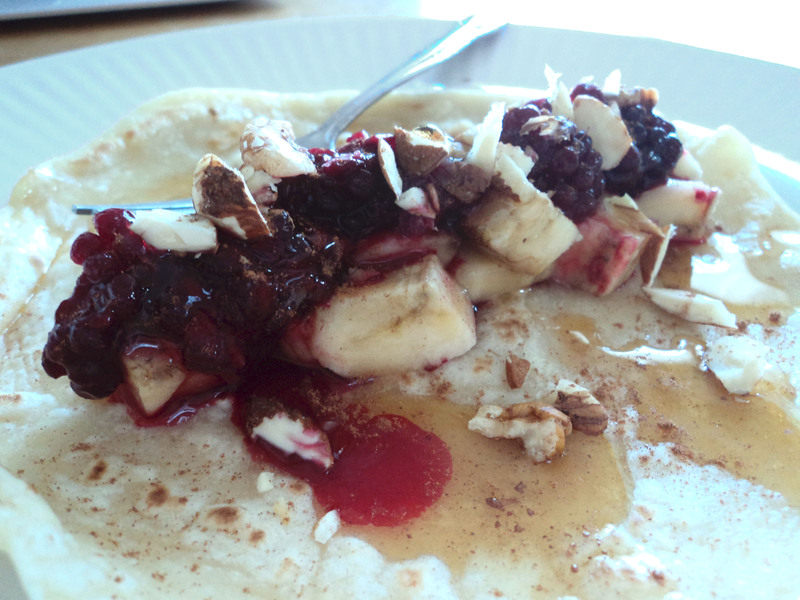 I just looked at that pic as it uploaded, and I’ll be back in a minute – gotta go eat another! Chop the dates up, then place them in a bowl with the baking soda, and add the boiling water. Leave to sit for about 15 minutes. (I have a hunch this is what made our dates soft enough). Soften the margarine, beat in the sugar, then beat in the vanilla essence and golden syrup. Add this to the date/water mixture. Then sift in the flour and baking powder. Mix all these to make a delicious, delicious batter. Now, you have a choice, to make one large or several small cakes. I prefer small ones myself, there’s just something about having a whole desert (or 2) to yourself. So either pour the mixture into muffin trays, or into a single large tin. Chuck them in the oven at 180°C ~15 minutes for small ones ~45 minutes for a large one. Like most cakes, if they spring back up after poking them, they’re done. While they’re still warm, drizzle them in caramel sauce and custard. Eat. Unfortunately, I can’t disclose the specific recipe for caramel sauce here; but it’s roughly margarine, golden syrup, sugar with a dash of soy milk, blended and heated in quantities until it becomes saucy. To make custard simply follow the ingredients on the package; 2 tablespoons custard powder, 1 tablespoon sugar, 2 cups soy milk, blended, heated and beaten in a pot until thick. After three days of searching for a good donut recipe, getting frustrated and giving up every few hours, Jessie finally found me a good one. One might even say, a perfect one. 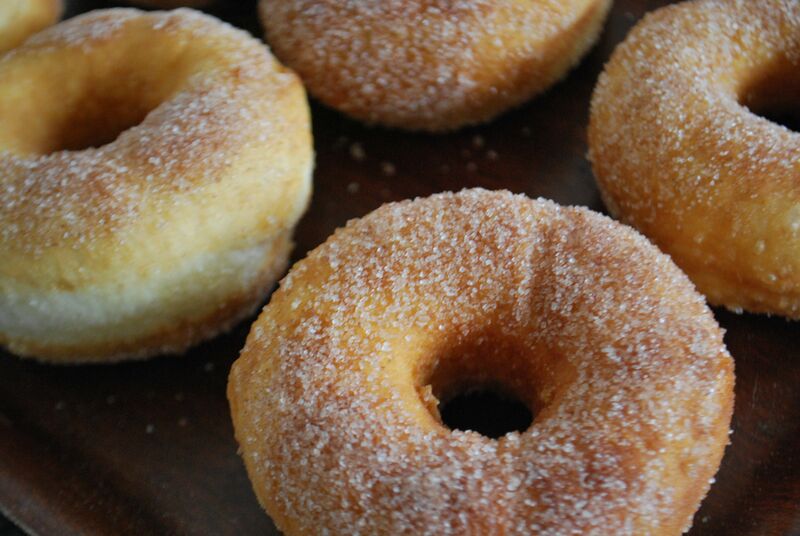 This recipe produces light, fluffy donuts, that are simply delicious to stick in your mouth. I use a bread maker for all my doughs; it means I don’t have to knead the dough, but more importantly the bread maker is an expert at making dough rise. Either chuck all the ingredients in the bread maker and tell it to make you dough (I always leave dough in the bread maker for a half hour once it’s done, so it rises even more), or combine the ingredients in a bowl, knead for about 10 minutes, and leave in a warm place to rise for a few hours. Roll the dough out to 1cm thickness. Using some form of round cutting shape (I use an upturned glass) cut the dough into circles, then using a smaller cutting shape (I use the lid of our vanilla essence) cut the middle out of each circle. You should be able to knead the remaining dough into a ball, and repeat this until you have lots of donuts and no dough left. Leave to rise for another 10 minutes or so. Half full a pan with oil, and heat to 190ºC (or use a deep fryer). If you’re like me and don’t have a thermometer that goes that high, you may have to play around with the temperature and practice on a few donuts to find the right heat. If the donuts brown on the outside without cooking the way through, then you need to turn it down a bit. Add a few donuts to the pan (as many as the pan will comfortably hold), and fry until the bottom is brown, then turn over and fry until the other side is brown also. Remove from the pan and shake any remaining oil off. Sugar and Cinnamon – Mix 1 cup of sugar (less for lower sugar) with 1 tablespoon cinnamon in a bowl or bag. While the donuts are still warm, put them in the mix and shake until coated. Chocolate – Melt equal parts vegan chocolate and the thick part of coconut cream from the tin. Once the donuts have cooled, dip in the chocolate mix. Leave to cool, and then dip again. Nuts or coconut – Using shredded coconut, or crushed nuts. 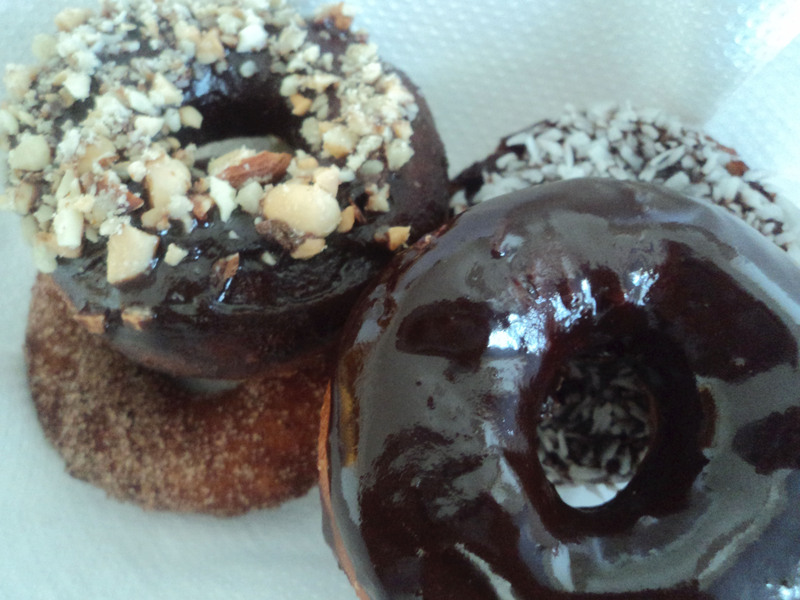 Dip the donuts in the above chocolate mix, then while it’s still wet, dip into the coconut or nuts. Wedges are a, well, not quick, but certainly easy side to many meals. There’s one secret you probably haven’t been told though. 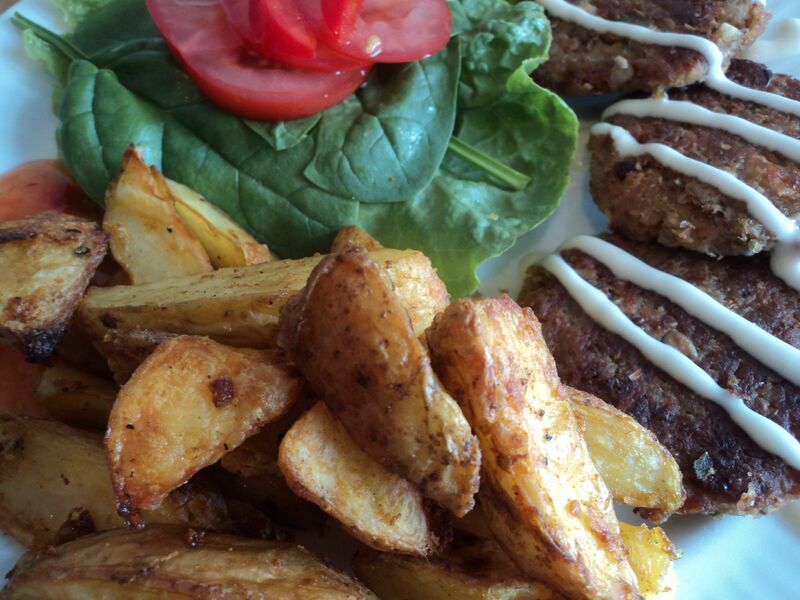 A secret that turns potato into wedges. A secret that I will divulge here (I must thank my Mother for this secret, but you can just thank me). The result is not just roasted potato in wedge shapes, but nice soft wedges in a crunchy outer shell. Cut the potatoes into eighths (sometimes you can get 10 wedges out of a big potato). SECRET TIME – add these to a pot of water, bring to the boil and boil for 10 minutes. They won’t be cooked right the way through, but they will be nice and soft. Remove from the heat, drain the water, and leave to cool for a minute. Stir in the oil, then sprinkle on the remaining ingredients; stir again. Chuck onto an oven tray, and bake at 200ºC for an hour. Once or twice turn them over and shuffle them around to ensure they cook evenly. 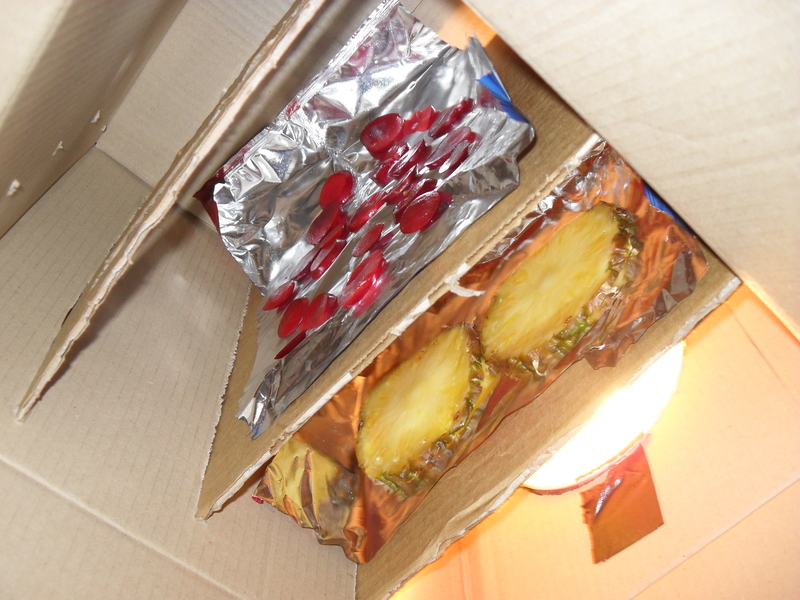 How to make your very own dehydrator, using what you have lying around your house. 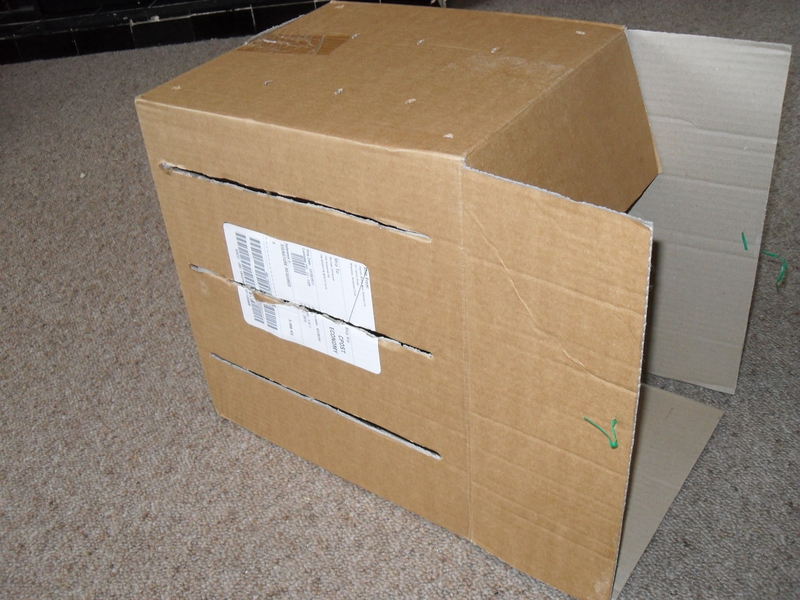 Choose the box to use for your dehydrator. 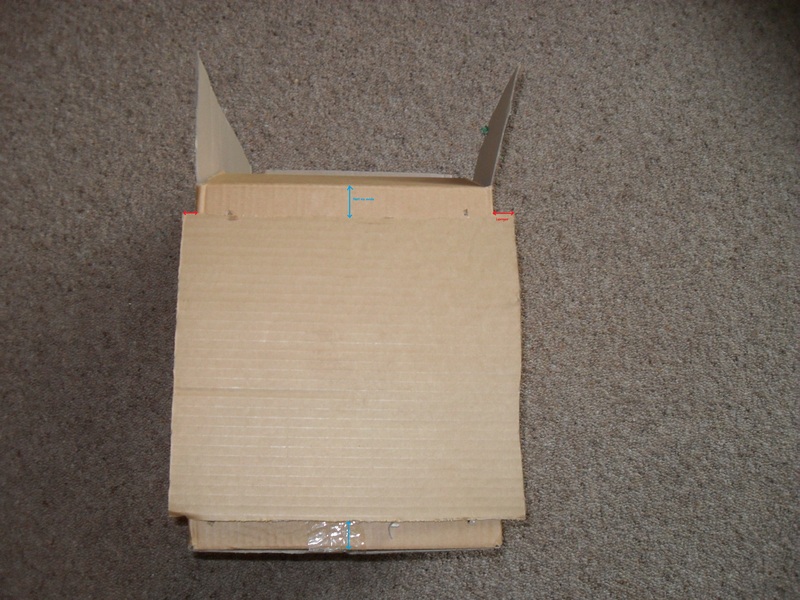 Cut shelves out of another box (or other cardboard). They should be longer than the box, but not as wide. 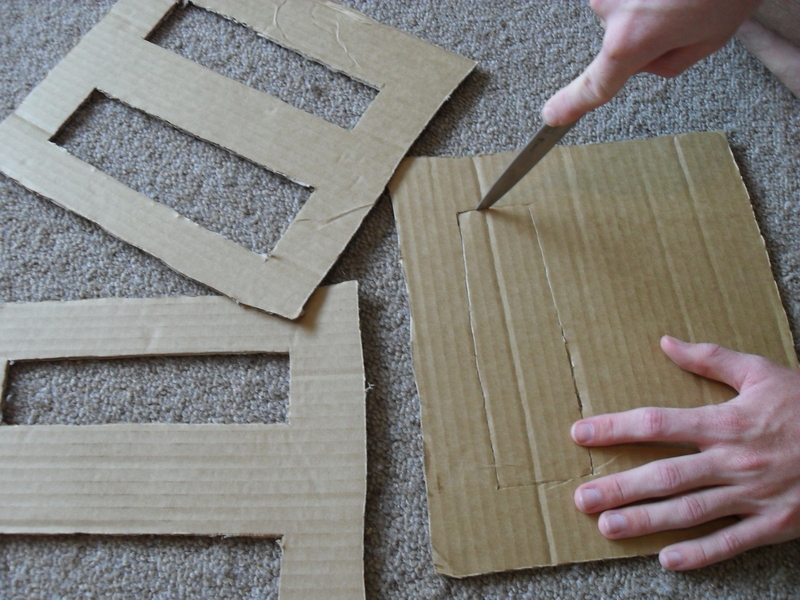 Cut slits along the side, just wide enough for the shelves to slide through, and a hole in the bottom for light. 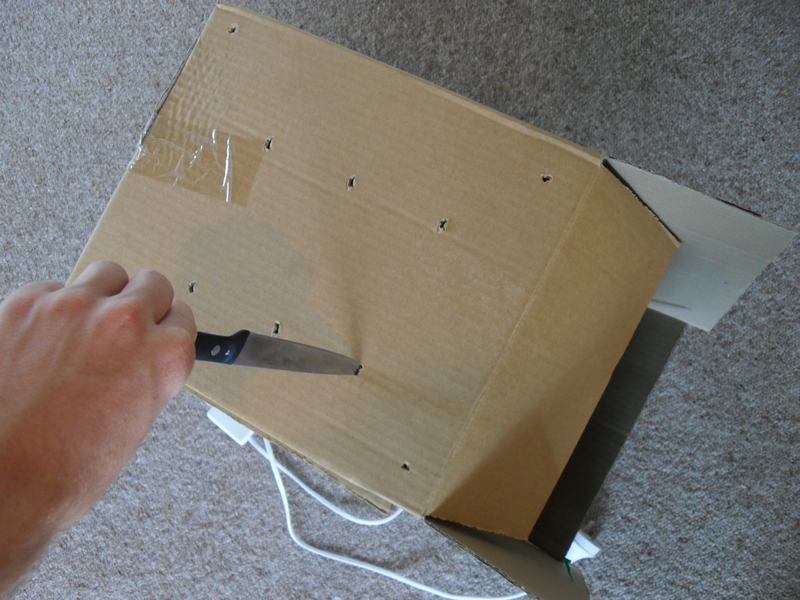 Tape the lamp firmly in place in the bottom of the box. Insert trays into the slits. 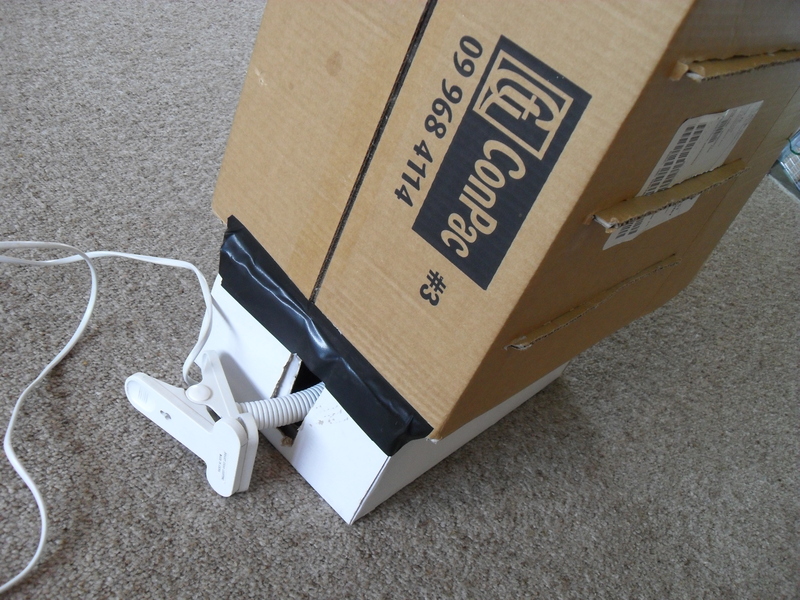 Cut a small space out the back of a shoe box for the lamp’s cord, then sit around the lamp and tape in place. 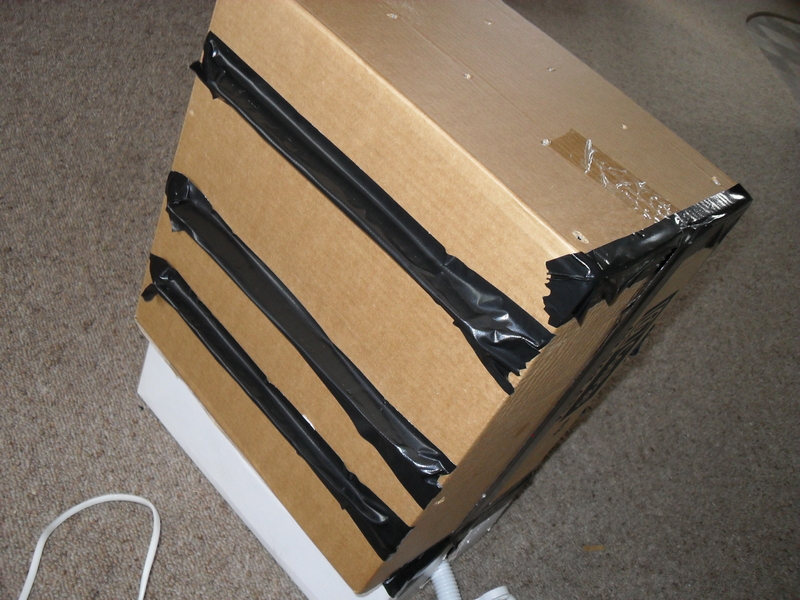 Poke a few holes in the top of the dehydrator box, to allow water moisture to escape. 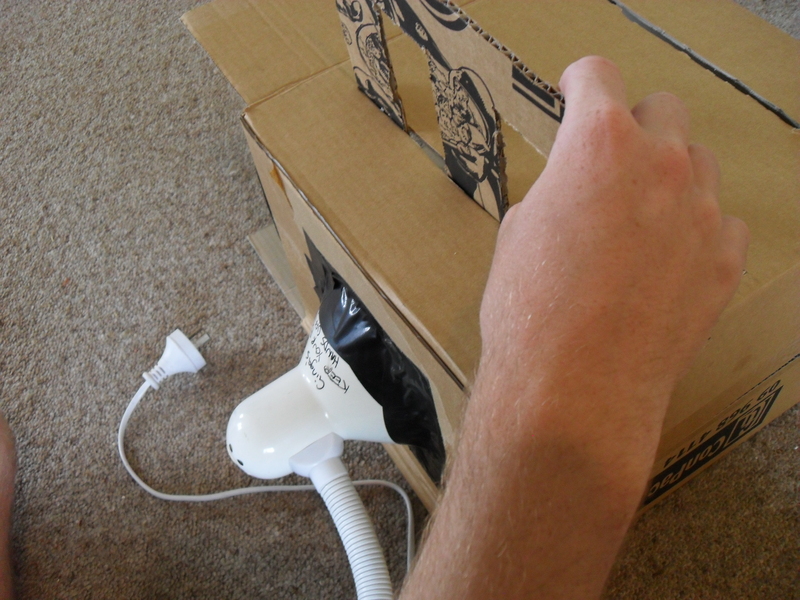 Tape up any areas around the edges of the box, and on the sides of the shelves where heat could escape from. 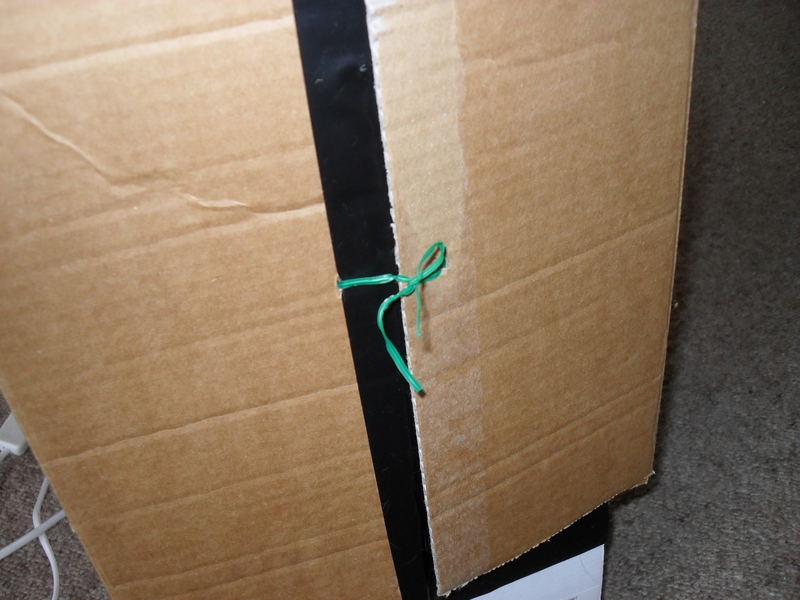 I also added a bit of tape to one of the doors, so that they overlapped when shut. Poke holes, and then some twistie-ties through the ‘doors’. This will allow you to fasten it shut. Fill with delicious things and dehydrate. 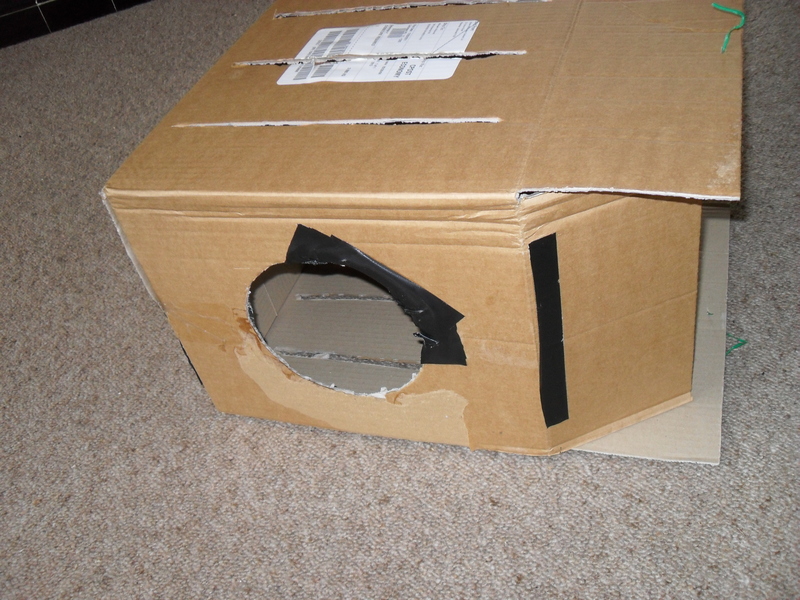 I use a 75W bulb, but you may find a higher (or lower) wattage suits your box better. It will depend on the size. But remember, energy saving light bulbs will NOT work. This relies on the ‘wasted’ heat of an incandescent bulb. But seeing as we want the heat, it’s not wasted in this instance. 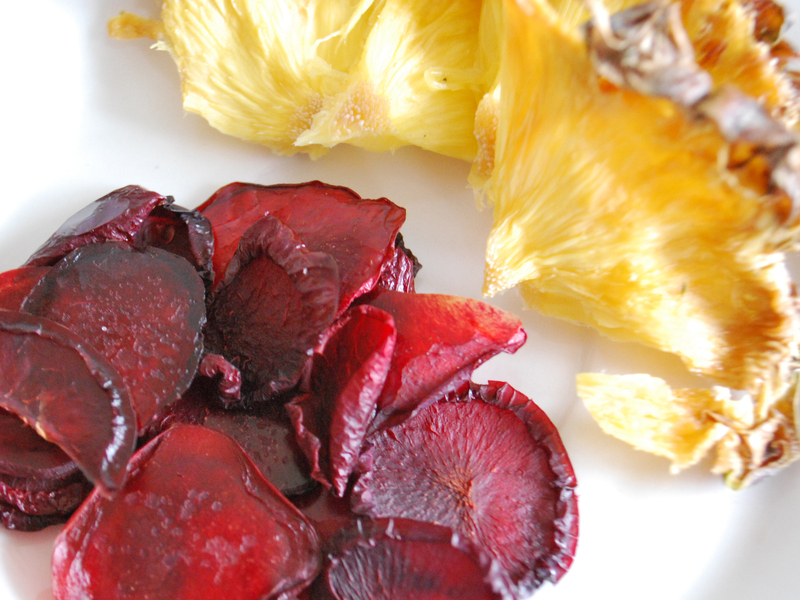 Test your dehydrator with a thermometer before use. 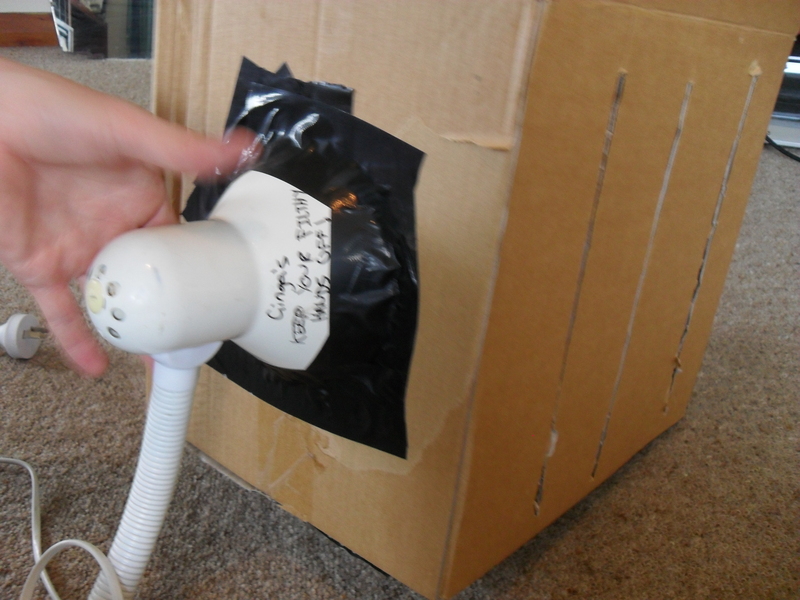 If it is too warm, it will cook your food, so use a lower wattage bulb. If the temperature is too low, your food will take too long to dehydrate, so use a higher wattage bulb. Also be aware of the ‘base’. 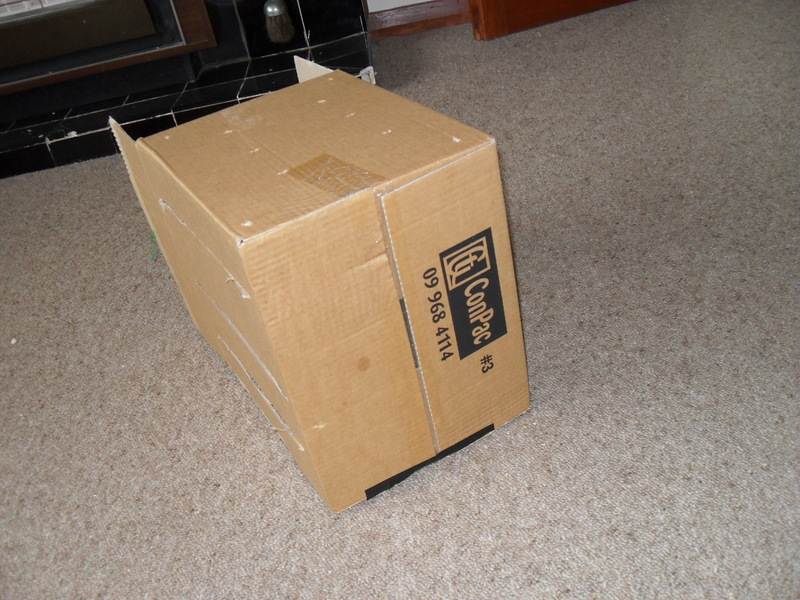 I was lucky in that a shoe box was the same height as my lamp. Your base should act such that the lamp isn’t supporting the body, nor is the body supporting the lamp.